Metro has installed this new gate to prevent cars from illegally turning left into trains. 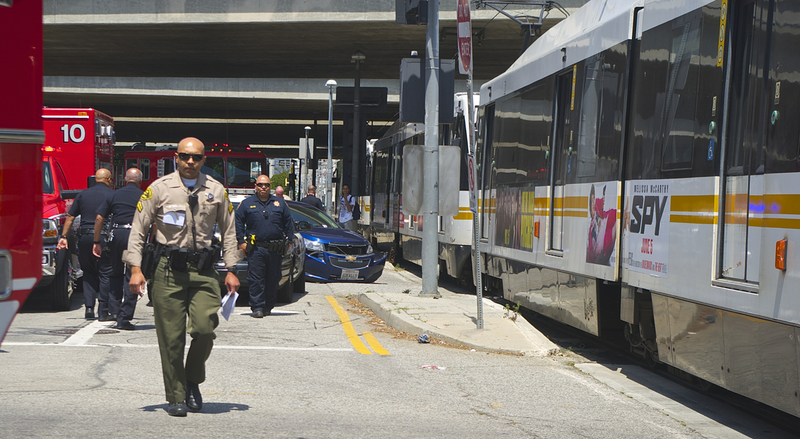 Photo by Joe Linton/Streetsblog L.A.
Metro is working to make the Blue Line faster and more reliable. One improvement already on the ground is a new crossing gate, which prevents cars from crashing into trains when illegally turning left from Flower Street onto the eastbound 10 Freeway. 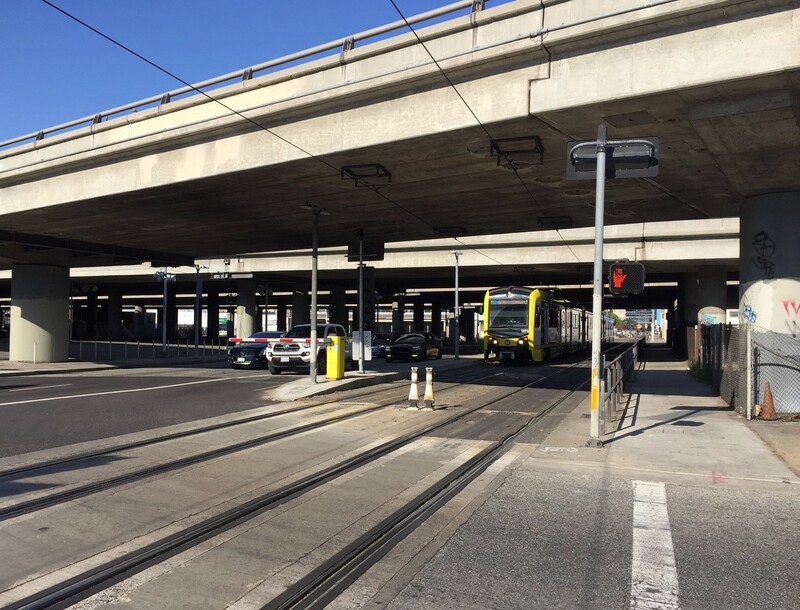 This 10 Freeway on-ramp has been the site of numerous cars crashing into Metro trains, including this May 2015 crash documented by SBLA Communities Editor Sahra Sulaiman. Car vs. train collision at the 10 on-ramp site in 2015 . Sahra Sulaiman/Streetsblog L.A.
See this November 2017 Urbanize article for documentation of more crashes at the site, and for more information on the installation and testing of the crossing arm. At yesterday’s Metro board System Safety, Security and Operations Committee, staff mentioned the new gate arm as they presented a series of Blue Line improvements that the agency is terming “The New Blue” (more on this below). Metro staff has additional street improvements under consideration for the Blue Line’s street-running sections in downtown L.A. and in Long Beach. Metro staff stated that they will be working with LADOT to finalize projects on Flower Street and Washington Boulevard. Overall, the operational improvements are targeting a ten-minute reduction in Blue Line end-to-end trips. Another photo of the new Blue/Expo Line gate in action. Photo by Joe Linton/Streetsblog L.A. The New Blue project will be mostly rehabilitating the 28-year-old Blue Line. It includes new tracks and major upgrades to the Rosa Parks Blue/Green Line Station. Metro staff reported that, though final details are still being worked out, project construction is anticipated to include eight months of partial closures on the line. This includes a four-month closure of the Long Beach to Rosa Parks portion, followed by a four-month closure from Rosa Parks to downtown Los Angeles. Multiple bus bridge services will transport Blue Line riders while the line is closed. The closures are expected to begin in early 2019. SBLA will be covering more aspects of Metro’s The New Blue as they become clearer in the months ahead; for now see articles at Urbanize, The Source, and the Metro staff presentation. One minor edit: The ramp is onto the eastbound I-10, not the 110 freeway. The close proximity of the 110 interchange would probably make it very difficult to replace that ramp, as the next eastbound ramp is at Los Angeles Street. One nice thing that I didn’t include in the article is that the gate arm goes down not just when trains are around, but also when pedestrians have the go-ahead in the signalized crosswalk across the on-ramp. I still don’t understand why LADOT and Caltrans cannot close that onramp and just send motorists down 18th Street to the Los Angeles St onramp? Commenter James Fujita differs with you. It seemed like the crossing arm was working well yesterday (though one driver shot past the offramp, the arm went down [for a pedestrian in the crosswalk], then the driver backed up nearly into it, then drove over the tracks to get onto the freeway). The on-ramp is Y-shaped, with on-ramps on Flower and on 18th Street… so theoretically it could be possible to close half of it – like just Flower… though this might mean that cars getting onto the freeway might back up onto the tracks on 18th. One would think that simplifying a 6 way intersection back to a 4 way one and removing the conflict and delay to rail transit would be a good idea. The South Los Angeles Street could be rebuilt to deal with the singular use by rubber tires vehicles and the slalom James fears. But in the upside-down world of Autos Uber Alles Los Angeles, let’s keep the complicated multi-phase intersection with long waits for Light Rail at 18th and Flower so that the freeway system has 30 entrance points from the downtown circle instead of 29. Agreed. The insane coddling of auto access from very direction is amazingly wasteful. It’s not hard to get on the freeway, and closing a couple of access points makes it no harder. Drivers would simply have to take a different street to get there. Instead we get rube goldberg style work arounds that drivers still manage to destroy. In Santa Monica they put bollards up in front of some of downtown parking garages to try to enforce only being able to make right turns into and out of the garages and EVERY SINGLE DAY I see people hook illegal U-turns around them going both in and out of the garage. There’s also a mid-block crosswalk in front of one right where the bollards end, where this maneuver results in drivers being in and parallel to the crosswalk.